What is it about revenge that so captivates us? Why is it that in movie after movie we see the good guy wronged, the bad guy gloating, and then the good guy destroying the bad guy in some way? This seems to be a story that has long fascinated society. It is a story that is as old as time and it never ceases to stroke our love of seeing justice meted out. But is that all there is to it? Oldboy would like to take on that question and then beat you with it. 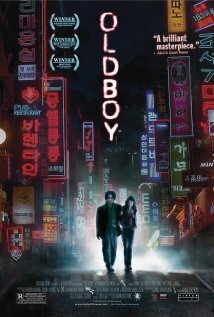 Oldboy is a Korean film by Park Chan-wook and is the second part of his “vengeance trilogy” which, while unrelated, are all thematically linked by the exacting of vengeance in some shape or form. The first and second are quite good, but this second is widely regarded as the best, a view I also share. The plot of Oldboy seems fairly straightforward at first. A Korean salary-man, Oh Dae-su, is kidnapped from a police station after having been arrested for being a drunk. He is dumped into a locked apartment building with only a TV, a bathroom, and a bed. There he remains for fifteen years, all the while aware that his wife has been murdered, his child reared by someone else, and his implication for the crime. He vows revenge on whoever did this to him and trains himself daily for the day he escapes. Just as he is about to escape, he is unceremoniously dumped outside, free and with new clothes, a phone, and a huge wad of cash. A phone call reveals that his kidnapper is still toying with him, wanting him to try to find him. Angrily, Oh Dae-su agrees and pursues his tormentor. Along the way, he meets Mi-do, a young woman who takes an interest in this strange acting man. Learning his story, she offers him a place to sleep and eventually falls for him. Oh Dae-su eventually meets Woo-jin, the kidnapper, in person. He is told that he must discover the reason for why Woo-jin hates him and unless he does, he will kill Mi-do. From there the movie deviates wildly from the stereotypical vengeance movie. Twists come in once about every ten minutes until the end of the movie, none of which I will spoil for you. 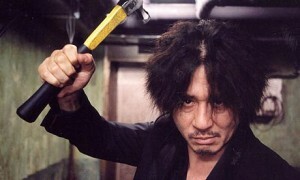 The important thing about Oldboy is how it deviates. While not going into exact plot details, it becomes very clear quite quickly that vengeance does not pay. Not for anyone. This theme is usually incorporated into films such as these, generally as an afterthought and usually in light of the bad guy having exacted vengeance on someone for “bad” reasons. We are clearly on Oh Dae-su’s side from the beginning of the movie. Who on earth wants to be suddenly taken from their life and imprisoned for fifteen years? Who wants their family taken away? Or their life? No one. Yet, even from the start, the movie lets us know that Oh Dae-su is not exactly an angel. The first five minutes show us his time in the drunk tank at the police station. We know he has flaws, he is like any of us, but he’s not the most innocent. It’s after the imprisonment that we feel completely on his side. Suddenly though, through revelations Woo-jin brings with him about the past, we discover that no, not all is right on the side of Oh Dae-su. He made some serious mistakes that had serious ramifications, though they seemed inconsequential at the time. Now, the past is catching up to him. At that moment, it is not just Oh Dae-su who has vengeance on his mind, but Woo-jin. The object of their vendetta is each other and everyone they come in contact with is pulled in with them. It is interesting to me how the Korean reasons for exacting vengeance both parallel and veer off from our own. The false imprisonment part we both have in our culture. But the second, the mistake Oh Dae-su makes in the past to slight Woo-jin, is not something I think any of us would take seriously. When confronted with this mistake, Oh Dae-su does appear visually troubled about the outcome that transpired because of what he did, but it is quickly covered up with a haughty ego fueled by his own conviction that he is in the right. 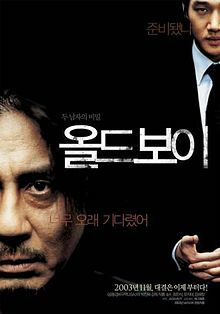 It is clear that the movie is showing the audience that this conviction is clearly non-sense by now, at least to the Korean audience. I get the feeling that they would understand that this haughtiness is clearly not the correct attitude to have and I have to wonder if an audience here in the States would have the same feeling. I conclude that no, we wouldn’t. We would probably remain convinced of our righteous actions and that the past is the past and what Oh Dae-su did is nowhere near as bad as what Woo-jin did to him, nor did it justify his actions. In this way, Oldboy seems to parody the common western view of what is justice. Who is in the right and for what reason? Is anyone? Is no one? We also quickly realize that though the problems are all between these two men, everyone else is affected. Some are affected actively, some affected without any conscious decision being made to ruin their lives. Anyone brought into this vengeance, living or dead, ends up the worse for it. This theme is generally not explored very much in Western film, I don’t think. We generally give a cursory glance at it and recognize that innocent people get hurt, but so long as the bad guy gets his just deserts then it’s OK. In Oldboy, this problem becomes part of the plot. The final minutes brings bystanders into the forefront and thrusts this problem not just into the lap of the principal actors, but in ours as well. Suddenly, they have to make a choice about how far they are willing to hate one another and themselves. Can, or should, they take it out on third parties? Even if some of them have already suffered? What kind of resolution is there in a game of mexican standoff when some players don’t even know they have been playing? Oldboy takes these preconceptions, throws them on the ground and stomps on them with a lot of blood in the process. It honestly, and brutally, brings the problems of vengeance into the forefront of the narrative, making this movie not so much about the exacting of vengeance, but about its toll on its participants. There are no easy answers at the end of the movie. There are no easy outs.